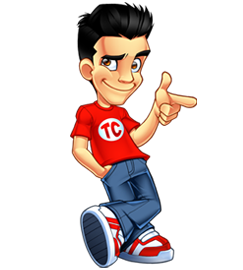 One thing that the majority of web entrepreneurs who are making money online have in common is that they have at one point or another commissioned for a custom logo or design to be made. While not everybody may need custom programming or content writing services, almost everybody needs a design or at least their own logo at some point. Even eBay sellers have their own logo, even though they may not have their own site. There is no shortage of freelance designers and graphic design companies who are ready and willing to take your work. However, this is not the only way to commission a logo design. This is where LogoMyWay.com comes in. LogoMyWay is a design contest website where users run cash-backed competitions and an army of freelance designers submit their entries in the hopes of winning the contest and the prize money. While this is actually not a new idea, there is really only one competitor to LogoMyWay which I will draw comparisons against later in this review. I’m personally a big fan of these contest design websites and have used several them several times in the past myself for my own sites, including PublisherSpot.com and PublisherChallenge.com. As you can see, you can really get top notch designs. The Contest Holder creates a new competition for a logo or design by writing a description for the design they want, outlining the type of look and feel they’re going for and any other details. They then set a price for their contest, with an allowable range from $200-$1,000, and set a deadline for the competition. The Contest Holder then pays LogoMyWay the money so that it is locked in a form of escrow which guarantees that the winning designer will receive the money. Designers start submitting their entries for the contest. The Contest Holder can optionally rate the designs and leave comments and feedback to the designers to help give the designers direction on what route to take. The Contest Holder selects a winning submission which awards the corresponding designer. The winning designer then sends the files (such as PSD, fonts used, etc.) to the Contest Holder and LogoMyWay releases the funds to the winning designer. What makes design contest websites such as LogoMyWay so useful is that they give the Contest Holder the power of choice. Using the traditional method of hiring a freelance designer or graphic design firm, you are essentially forced to like what they give you. While most designers will give you some free revisions, they are usually minor changes. The higher-end designers will often provider several different mock-up’s to choose from, but we’re still talking about 3-5 different routes. With LogoMyWay, you’re literally given 150+ submissions to choose from. 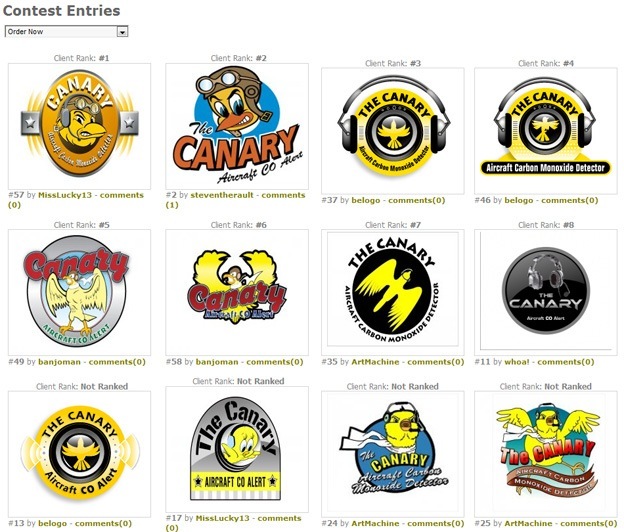 Some competitions have had over 300 entries! While many of the entries will be of lower calibre, there will still be a lot that are of high-quality and interest you. You may find yourself going with a creative design route that you hadn’t even considered before. As a result of choosing amongst hundreds of designs that were created according to your original description and specs, I find that Contest Holders (including myself) are almost always very satisfied with the end result. Whereas, if you had commissioned for your logo or design to be done by a single source, if you don’t like what they come up with, it’s too bad for you. LogoMyWay makes money by charging a 10% fee of the contest’s prize. For example, if you run a contest for a logo and put up a $400 prize, LogoMyWay will charge you $440 ($400 for the the prize and $40 for their cut). I find this to be a very reasonable price, except for one problem: it penalizes those who run bigger contests. For example, when I made the design contest for PublisherChallenge.com, I put up a $1,500 prize pool. If I had run that on LogoMyWay, I would have had to pay $150 for the 10% fee. Compare this to somebody who run a $250 contest and only has to pay a $25 fee. I don’t think this is fair, especially since many designers want to see higher-priced competitions. As a result, this would make me think twice before running a $2,500 or $3,000 design contest on LogoMyWay as I’d be forced to pay a $250 or $300 fee on top of the prize money. I therefore would like to see a tiered payment structure that doesn’t penalize Contest Holders who are willing to run larger competitions. The quality of the 200+ designers at LogoMyWay is actually quite good. As mentioned above, the majority of submissions will be of fairly low calibre, but that’s normal. What matters is if there are any decent designers submitting entries, and the answer to that is yes. There has only been 7 competitions run on LogoMyWay so far, all of which were only with $200 prize pools (the minimum), yet there have been some great submissions even at that rate! 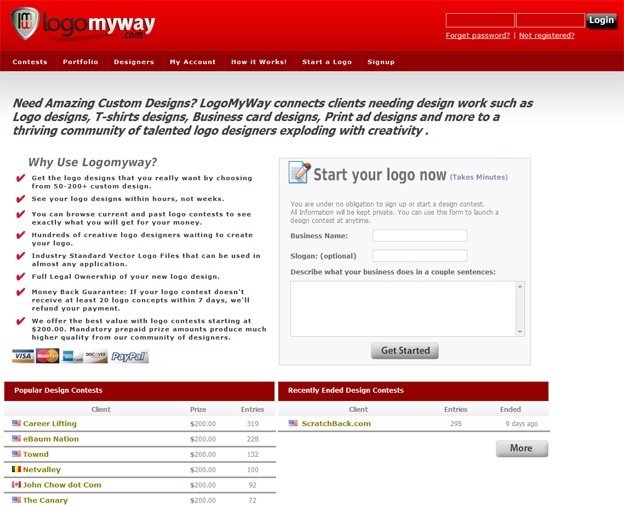 In many ways, LogoMyWay is effectively a clone of the popular 99Designs. 99Designs has been around for around a couple years now and was created as its own separate entity after having been original run and conceived in the Sitepoint.com Marketplace. To be honest, 99Designs is a great site, which is most likely why LogoMyWay is so closely modelled after it. However, there are a few differences between the two sites. First, all the contests on LogoMyWay are guaranteed, which means that the Contest Holder must select a winner. This is very beneficial to designers, as it means that the better submissions stand a good chance of winning. It also benefits Contest Holders in that designers generally have more incentive to improve and continue to follow through on their submissions. Another difference between the two sites is that LogoMyWay is brand new. As mentioned earlier, there has only been 7 contests run so far. This is actually beneficial for Contest Holders as it means your contest will receive more attention from lack of competition (other contests). However, this perk will inevitably diminish as the site starts to gain in popularity. While LogoMyWay is new, it does already have over 200 active designers. I’m actually very curious how Joe Daley, the owner, got so many designers so fast! The last difference between the two sites is that LogoMyWay offers a money back guarantee; if your logo contest doesn’t receive at least 20 logo concepts within 7 days, they’ll refund your payment. Their site states ‘logo’, but I wonder if that applies to general designs as well. For some reason, you are limited to giving away a maximum prize of $1,000. I do not know why they chose such a limit, or even put any limit at all. All it does is alienate those who want to run higher-quality contests, like myself. I tend to want the cream of the crop when it comes to design work, and have been known to spend over $3,000 on a single design. Being limited to a $1,000 price is not very appealing to me. This should be increased to something like $5,000 or else removed completely… I just don’t see any reason to have a maximum. Currently, contests on LogoMyWay can run for a maximum of 14 days. It takes time for designers to send in revisions and for Contest Holders to provide helpful feedback. Limiting a timeframe to a maximum of 2 weeks only hinders the contest by limiting the maximum quality a contest holder can get out of his or her contest. The maximum should be increased to at least a month. While it may not happen often, I can see situations in which dishonorable people steal parts of designers entries. In order to help protect designers, it would be nice if LogoMyWay automatically watermarked their submissions. This could be an optional feature for designers. Going with a good freelance designer or graphic design company is still a viable option. However, if you very choosey and a perfectionist like me, you might be better off going with a graphic design contest on a site like LogoMyWay. You can run a contest for as little as $200 and actually get several hundred submissions from scores of designers. While you’re forced to award a winner, with so many entries and due to the competitive factor, you will most likely find at least one entry that you love. In fact, it’s not uncommon for the Contest Holder to have a hard time selecting a winner because there are so many good entries! There are a few very minor issues that I would like to see LogoMyWay address as mentioned earlier in this review, but other than that they are a perfectly viable solution for anyone wanting to get a professional logo or design done. Great review! And damn, what an entries on a single contest! I guess some designers must feel frustrated not winning a contest time after time? I understand this is a ‘paid review’…..perhaps they could actually allow you to engage in this process, for free, as well?…..then, you could blog about it, and give even more ‘personal’ insight into their service…. This market is absolutely saturated, in my honest opinion….with company’s like the CrowdSPRING community that have 13,000+ designers available worldwide……but, I wish this company the best, nonetheless…….. I agree with Howie in regards to getting your logo designed at their website – it would make for a much better review. You should hold a mascot competition; that would be quite interesting and beats paying $700+ for a mascot from SOSfactory. I think I will do this for a logo design on my blog a few months down the road! I just wanted to say that there are far more then just one competitor to “logomyway”, including my company’s site, eLogoContest.com, which launched the same time as 99Designs did. I also noticed that they appear to have blatently copied the “designer guidelines” found on our site (word for word!) and are EXTREMELY similar in design and functionality to another competitor who has been around for a while, LogoTournament.com. I just wanted to point out that not only is it not an original idea, but they couldn’t even think of an original way to frame that idea. Not sure if this comment will be allowed to be posted, seeing it is a “paid” review, but I thought I would submit it anyway. I’m sure that the above link will be quickly edited, but I do have screenshots if any one is interested. Actually I never heard of you until now. I paid a freelance writer from elance to take care of time consuming things like policies, guidelines and terms. I will have him go over his work and change anything that is needed. As far as the design and layout of logomyway I picked an easy to use interface that I thought was best for designers and contest holders without copying anyone. We spent about 5 months and thousands of dollars programming the backend and working on a design. elogocontest registered 2007-12-04 But you say you launched at the same time? Sitepoint spun off 99Designs on January 14th, 2008 (http://99designs.wordpress.com/page/8/), eLogoContest launched 12 weeks later on April 9th, 2008 (http://www.elogocontest.com/blog/2008/04/09/its-alive-elogocontest-version-10-launches-with-much-fanfare/). We started development in 2007 although a domain name was not selected until 08, as you saw from the whois. As far as you not hearing about eLogoContest until now, it seems strange that you would not have done any research on your competition prior to launching a site, eLogoContest is among the top three results on Yahoo and Google if you search for “Logo Design Contests”, granted, we’re certainly not the biggest crowdsourced design site out there, but any looking around at all would have unearthed us. I would appreciate it if you would remove the plagiarized content from your site ASAP. And my point about the similarity to LogoTournament was that it isn’t just similar, your index page is pretty much a mirror image of LogoTournament. Good luck, it’s a great market to be in, just try to be a little more original in your execution of it. Nice review. Seems these guys are getting more exposure lately than ever before, with multiple blog reviews etc. Will definitely keep them in mind when I decide to get a new logo made. Spec Work is bad! It undervalues the work of designers, and the profession on a whole. It sees designers producing work, that may not even be used! Of course it is the designers choice to participate though, and thats the real shame…. I’m on the hunt for a logo at the moment and I think I might check these guys out. They seem to do very good work. Has anyone else used them on here? Wow, this is a nice review. I have never heard of this company. This is a very useful post considering that we are a design & development company and we are always looking for great new places like 99designs to get in and try to win competitions with. I had good timing with finding this post. I am actually looking for a new logo and/or site design quite soon. I’ll definitely look into this service first. Thanks Tyler. I’m glad that I found this post. I normally spend around $100 for a logo, with three concepts and unlimited revisions included. I’d glady spend twice the amount to get more concepts and designs to choose from. Logo’s are such an important part of business and branding. This has never been an area I cut corners in. What if you don’t like any of the submissions? Can you get your money back? I know it’s a lot better than paying just one person to do everthin but still – the choice might be limited. Superb review, surely seems to be one of the best company for logo designing. I’m in the process of doing two sites and can’t seem to doodle a logo I like since I’m too invested in them. I like the at least 20 logos or money back guarantee. Also, as a designer, I can sign up and possibly make a buck. If you want to do web design, you should be able to come up with your logo. What’s up with that? When a customer want’s a logo will you come here for ideas? You may be you have to choose something simple and clean. May be only typo? I`m running a own small web design studio and logo design include one of my main activities. great review…all the designers are probably very experienced. Thanks for letting us know about this great site. We are actually in the market for a new logo and we might give logomyway a shot.